The best training frequency for muscle growth is a controversial topic. Most elite bodybuilders swear by training a muscle only once a week (Hackett et al., 2013). A recent meta-analysis concluded that working a muscle group twice per week was superior for hypertrophy compared to once per week (Schoenfeld et al., 2016). Still, modern progressive lifters argue that training a muscle multiple times per week gives better results. Bret’s client Erin is a perfect example of this. She’s seen amazing results training the Glutes a whopping 6 times per week! 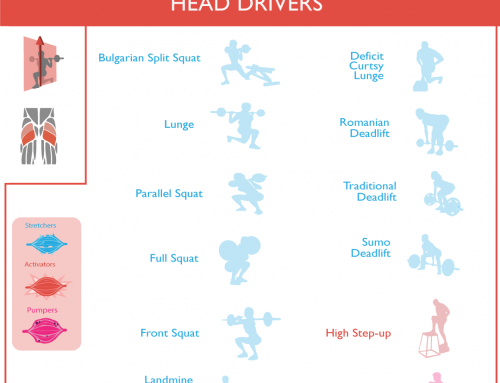 How often should you train the glutes for maximum results? The short answer is 2-6 times per week. The long answer requires you to read on, as there are variables you will need to adjust in order to optimize your recovery and ability to train effectively at a given frequency. I read your article describing stretcher, activator, and pumper exercises for the glutes. Can the upper body exercises also be broken down into these categories? And how could I find out about these? Certainly, they can. As a rule of thumb; band exercises don’t damage the muscles as much, and are easier to recover from. Machine exercises are generally also easier to recover from. Exercises that put a lot of tension on the muscle when it’s stretched, like dumbbell flyes (chest), pull-ups (lats), incline bench biceps curls, overhead variations of triceps extension, ab wheel ‘roll-out’ (abs), wide-grip bent-over rows (middle traps/rear delts), and DB shrugs (upper traps) damage the muscles more and probably need longer recovery. Hi, I have read articles from you and brett and I have a question. I’m a skinny woman slowly bulking. I currently weight 44kg and am 5″5, gaining weight is difficult because my metabolic rate is quite high. I don’t have access to a Gym as I am a med student and am always busy! I do however have barbells (with max weight 45 lbs) and resistance bands. 3. doing your recommended exercises and doing higher reps rather than heavier sets? I know I;m not doing progressive overload anymore since that would require me to purchase more and more weights which I don’t have space for. Can I not gain size in the glutes from higher reps? Thanks for your reply, Simran. Indeed, eating more is important if you want to gain muscle. However, given your situation, training with progressive overload may be even more important. At a certain point, doing more reps is not going to stimulate any further growth. I know you probably hate to hear this, but investing in barbells you can load with more weight (up to 250 lbs) is going to make a major difference for you. Otherwise, you should focus on movements you can do with only one leg, like one-leg hip thrusts, one-leg hamstring glides (on floor) and one-leg squats. This increases the resistance without much need for weight. Other than that, you could work with increasingly stiffer bands. However, you should re-evaluate whether it’s possible to fit a gym membership into your busy med schedule. If only for 3 times per week 30 mins per workout. Could I add more exercises for hamstrings/quads?? (NOT for glutes) For example, 2 more exercises of different variations of leg curls or leg extensions/ leg press? I typically do anywhere from 7-8 exercises with 3-4 sets each on my FULL leg days. Or is this doing too much? Again, thank you so much. Hope to hear back! You can take the Squat as a proxy for how advanced your Quads are, and the Deadlift as a proxy for how advanced your Hamstrings are. I’ll be releasing an article with much more info on this soon. I think you’re probably overdoing it on the amount of exercises and sets. I advise focusing on the Hip thrust, Bulgarian split squat and Deadlift for the glutes. Those are the bread and butter. Aim for 10-25 sets of these per week (again, depends on how advanced your glutes are). Focus on doing 15-35 sets (the more advanced you are, the more you should do) of stretchers/activators per week. I’m starting back to lifting weights and have read your article and several books including Bret’s Strong Curves. I am still a bit confused as to how man different exercises I should do each workout, if I should combine glutes and legs on the same day or separate days, and should I do progressive overload every week or every 4-6 weeks? For instance, I started doing hip thrusts, deadlifts, squats, cable kickback, lying band hip abduction (to activate glutes) and fire hydrants (activate glutes) with 3-6 sets of 10 twice a week. then I would work upper body the next day. It’s fine to combine glutes and legs on the same days, as they’re quite hard to isolate from each other. Great exercises to do. 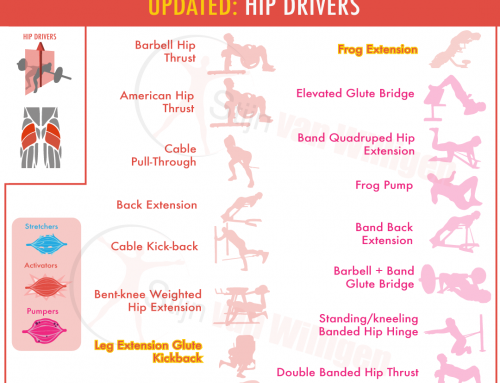 Looks like you’re doing about 25-35 sets of activators/pumpers in total for your glutes. Make sure you do about 10-15 sets for your glutes on every workout. Later if you get more advanced you can start training more frequently than 2x per week (hitting the glutes 3x for example). I’m currently 57kg, and am trying to lean gain some muscle og strenght as I’ve lost alot of strenght the past year(s) due to not eating enough and being in a calorie deficit too much of the time, + my shoulders started having some trouble b/c of alot of benching and low bar squatting (and too little warmup and prehab. Not so clever!) I used to squat 97.5, bench 70kg and sumo dl 125kg, and am no where near now. I’m a big fan of high frequency traning/fullbody training, and have done that or upper/lower body split for several years now, 4-6xper week. The calculator says that I should train glutes 8x per week, is that correct? Goal is weights 4-5x a week, and 1x some kind of interval running, because I enjoy it and want some conditioning as well. and a total of 15-25 sets per musclegroup/week? I really want to build my glutes and X-frame, and bring up my chins (can do 4-6 reps now in the rings) and SBD gains! Shoulder problems due to bench pressing is almost always a technique problem: keeping the shoulders back and using a powerlifting technique can often help. Sure 8x per week could be correct. So training every day (7x) is a practical way for you to train optimally. 4-5x per week is also fine and no problem at all. Hi again Stijn, have not seen your reply until now! Thank you so much. Yes – I do use a powerlifting technique, but I might have had some (maybe still do) technical errors in the past. But I’m very much focusing on technique to stay healthy and get strong again! I have changed up my program a bit, using DUP principles and currently doing 4×10/4×8/5×6+. Squat, chins, hip thrust x3 per week. Sumo deadlift, bench x2 per week. This would be around 20 sets on quads, hamstrings, glutes, back and shoulders, and 16 for chest. I would like to train my glutes 6x a week by following Bret’s analysis but how much maximum volume can I do per workout in order to not overtrain? How many stretchor, pumper, activator per workout can I do ? And can I mix stretchor and activators in the same session ?